Meaning of stripes in BJJ? 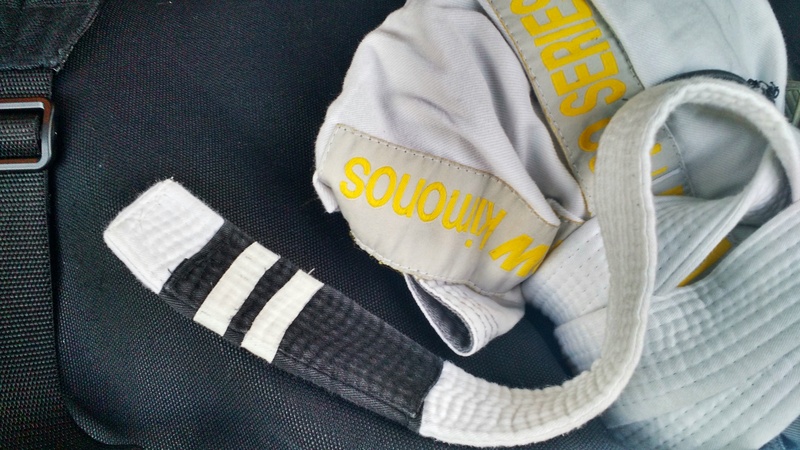 The stripes on a belt is a mark of progress, which is useful for the coach, and encouraging for the student.In the gym that I attend, every 6 months there is promotion night, and students could get 1 or more stripes (or a new belt!) depending on how much they’ve improved. Some people train twice a day, some people train twice a week, everybody learn at a different pace. It is an easy system to keep track of progress. What have I learned in the past 6 months? Move smoothly: The most comments I’ve heard from rolling partners is that I “flow” more. That I “jerk” less and don’t tense up as soon as I get push/pull or caught in something. Staying calm, and keep moving. Escape from bottom: Beginners spends the bulk of their time on the mat practicing escapes (not necessarily by choice), which is natural because we get put there by more skilled individuals. This is great because one of my biggest fear is being on bottom, and I’m getting a lot of time practicing what to do if I’m there. Focusing on a few submissions techniques: There are so many possible submission, it is better off focusing on the several big ones that gets used the most (e.g., arm bar, key locks, rear naked choke). How to be accountable for my own training? Now, between each stripes, there is usually at least a 6 months wait if not more. On a good day, everybody can motivate themselves, no problem. We all have our down days though, and here is how I keep myself accountable to my training even when I’m on an “off day”. Keeping a record: Each time after class, I write down one thing I learned from the class, the people I’ve rolled with, and how many of those did I rolled with the first time. Keeping a record makes me know how often I AM there, and how much did I actually train after drilling. Numbers don’t hide. If I only rolled once, I only rolled once. If I haven’t been to class in a week, its all there. Being there. There are so many times I could come up with excuses to skip and go do something else. Best thing is to not even think about it until the time comes, and then just start driving towards the gym. Gives myself no alternatives. Roll with someone new: Don’t just roll 1 or 2 rounds with the familiar faces and sit by the side during rolling. It is important to make an effort to roll with people of different sizes, level, and style. Focus on one thing. I make an effort to focus on a particular aspect while I roll that week (e.g., escape from side control, actively look for opportunities to take the back). If I couldn’t make something work, I make sure to ask a senior student or a coach to show me what I’m doing wrong. ← Previous Previous post: How to sell the things I don’t need anymore?